The seas have been rough for shipping companies worldwide and the ripples have been felt by the port operators as well. However, Westports Holdings Bhd continued to deliver high returns to its shareholders, proving its resilience as one of the leading transshipment hubs in Asia. Its return on equity (ROE) over the three financial years in review is admirable — an outperformance that is no fluke. ROE came in at 29% in the financial year ended Dec 31, 2014 (FY2014), 26.6% in FY2015, 30.8% in FY2016 and 28.6% in FY2017, going strong even as shareholders’ equity grew from RM1.76 billion in FY2014 to RM2.3 billion in FY2017. Its performance versus that of its peers is even more impressive on an adjusted weighted ROE basis over three years. The high ROE was thanks to steady growth in earnings despite the operating landscape becoming more challenging. 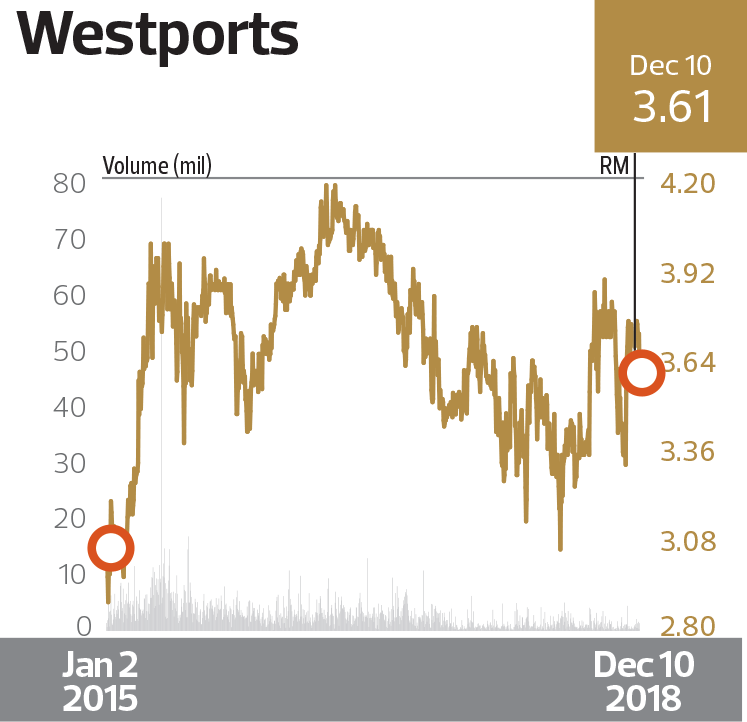 Westports’ net profit rose from RM512.2 million in FY2014 to RM651.5 million in FY2017, implying a three-year compound annual growth rate (CAGR) of 8.4%. This performance was despite a tough 2017 that saw its container throughput, measured in twenty-foot equivalent units (TEUs), fall 9% year on year to nine million. The high ROE was due to a consistently high dividend payout ratio that has stayed at 75% in the past five years. In FY2017, it paid 14.3 sen dividend per share (DPS) out of 19.1 sen earnings per share, translating into RM446 million in total dividend payout. Westports declared a DPS of 14 sen for FY2016 and 11.1 sen for FY2015. Considering the difficult conditions last year, the weather ahead looks better for Westports. Recall that in April last year, CMA CGM SA, China COSCO Shipping Co, Overseas-Orient Container Liners (OOCL) and Evergreen Line launched Ocean Alliance. This new partnership meant a change in strategy that made Westports a secondary hub in Southeast Asia with 11 services compared with 20 services for PSA Singapore. This coincided with Westports completing its Container Terminal 9 wharf, boosting its capacity to 14 million TEUs. In other words, Westports was hit by underutilisation last year. Group managing director Ruben Gnanalingam had told The Edge that he expected the volume correction from shifting shipping alliances to taper off in the middle of 2018, which would mean a return to growth. In its latest quarterly results release, Westports indicated that its full-year container throughput is expected to grow by a single-digit percentage this year. According to AllianceDBS Research, the company has projected total volume expansion to range from 3% to 8% in 2019. “This will be driven by both transshipment and gateway volumes, although the former is expected to see marginally faster growth. Management also considers this to be a conservative target, factoring in some spillover effect from the protracted trade war between the US and China,” says the research house. While 5% growth this year is still lower than the port operator’s 2016 container throughput of 9.95 million TEUs, a fresh growth trajectory will signal that normalcy has returned. This means Westports can now focus on optimising its capacity utilisation as it has indicated that it can handle up to 12.5 million TEUs without seaside congestion. For shareholders, the company is on a sound financial footing for future growth while maintaining strong returns. Based on its 28.6% ROE for 2017 and 75% dividend payout ratio, the company’s sustainable growth rate comes to 7.15% — plenty of room for growth before it needs to start gearing up or tapping shareholders for financial support. The key growth driver will be the new concession for Westports2, which is being developed over 20 to 25 years. The existing Westports concession was recently extended to 2054. The two concessions will share the facilities. Westports2, located contiguously to Westports terminals, will house 10 container terminals. When completed, the two concessions are expected to be able to manage 30 million TEUs between them — more than double the existing capacity. The increased capacity will make Westports more competitive in attracting services from shipping alliances that it currently cannot because of capacity limitations.